Staff was very Friendly, Good price with excellent room, Loaction near CIQ. Friendly staff. Huge and Clean room, Have a lot of restaurant nearby hotel. Got police station at downstair (Safety). Will visit here again. Friendly Staff. Nice place (near Woodland CIQ), Got a lot of restaurant and shopping mall nearby here. Will visit here again. Very Affordable Price as a budget hotel. Bonus for this hotel was the room space are huge and comfortable for two person. The room is comfortable & clean, as well as the bathroom. Easy access of drinks (downstairs - hot & cold water). Friendly & helpful staff. OYO 601 I Stay Hotel This rating is a reflection of how the property compares to the industry standard when it comes to price, facilities and services available. It's based on a self-evaluation by the property. Use this rating to help choose your stay! 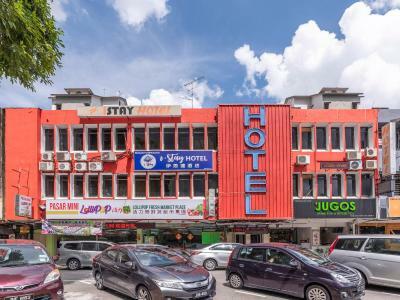 Located in Johor Bahru, 2.7 miles from Angry Birds Activity Park, OYO 601 I Stay Hotel has air-conditioned rooms with free WiFi. The property is around 3 miles from JB City Square and 6 miles from Singapore Turf Club. The property is 7 miles from Causeway Point and 11 miles from TGV Bukit Indah. At the hotel, every room includes a desk, a flat-screen TV and a private bathroom. At OYO 601 I Stay Hotel every room is equipped with a seating area. AEON Bukit Indah is 11 miles from the accommodation. The nearest airport is Sultan Ismail Airport, 19 miles from the property. When would you like to stay at OYO 601 I Stay Hotel? This twin room features air conditioning, tile/marble floor and flat-screen TV. House Rules OYO 601 I Stay Hotel takes special requests – add in the next step! I like the room! The room is big and clean. I will stay again at the hotel, next time! No parking. Getting parking fine because we park our car without the parking ticket although we park in the parking spot . We are not local, so we did not know about this. It would be great if the hotel staff informed us about this earlier. Great location. The room was spacious. Iron is provided when needed. Comfy bed. Air condition working perfectly fine. There is no lift so we had to carry our luggages up the flight of stairs to the reception to check in. The beds were comfortable & the aircons were working well. The character of a Chinese uncle is not friendly at all. Uncle Chinese Receptionist is the most rude and attituded like scorned guests.